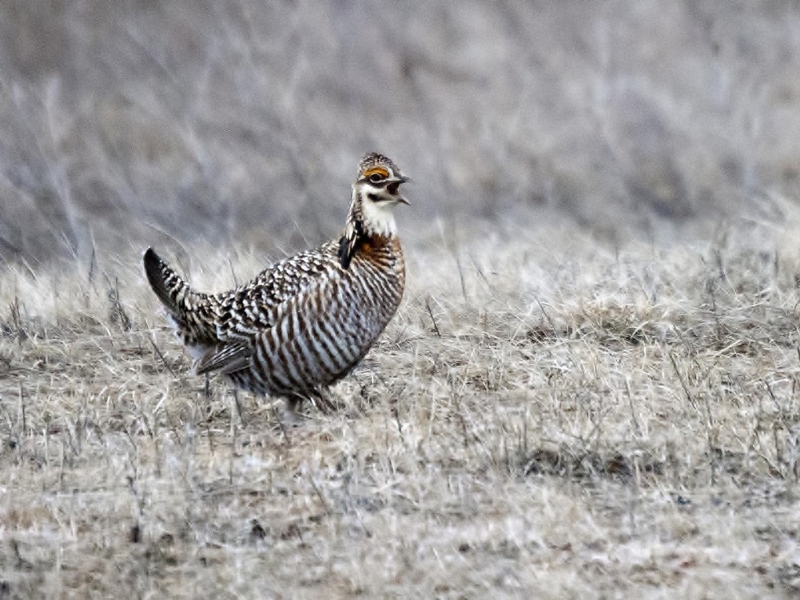 The scientific name of the Greater Prairie Chicken is Tympanuchus cupido. Translated from Latin, that loosely means “drummer of love.” The quirky name comes from its elaborate and famous courtship ritual, and Sunday morning I was lucky enough to witness it. 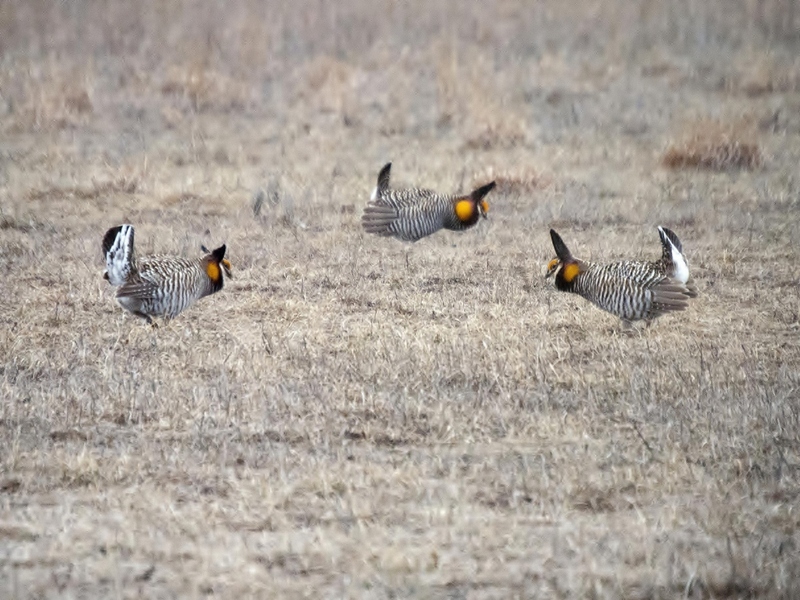 Greater Prairie Chickens, technically a species of grouse, used to be common, but their numbers plunged as the country’s grasslands were converted to agriculture, and now they’re mostly limited to carefully managed and protected prairie remnants like those found in Central Wisconsin. Anyone can pay $15 for the privilege of getting up at 4 AM on the April morning of their choice, tucking themselves into a wooden blind so small that it’s hard to sit upright, and sitting in the freezing cold darkness waiting for the birds to appear for their performance. It’s totally worth it. Each one stakes out his own little territory to perform in, and every so often disputes arise, leading to a lot of chicken-like clucking and cackling and occasional physical aggression (this next photo is very blurry, and the one after it isn’t great either, but you try getting a photo of birds in motion in dim morning light). By 7:30 it was fully light, we still had yet to see a single hen, and there was less actual booming and more preening and pecking at seeds going on outside the blind, so we finally left. After reading descriptions of this ritual and seeing many photos of it, getting to witness it first-hand was amazing, and I highly recommend it if you ever get the chance. Birds with inflatable orange air sacs in their throats. Nature sure is weird. Weird, but pretty great. Maybe they were doing a dress rehearsal for when the ladies finally showed up? That’s a rare experience. I’d love to see that someday. Unfortunately, that seems more and more unlikely as habitat continues to disappear. They are extirpated here in the prairie provinces now. 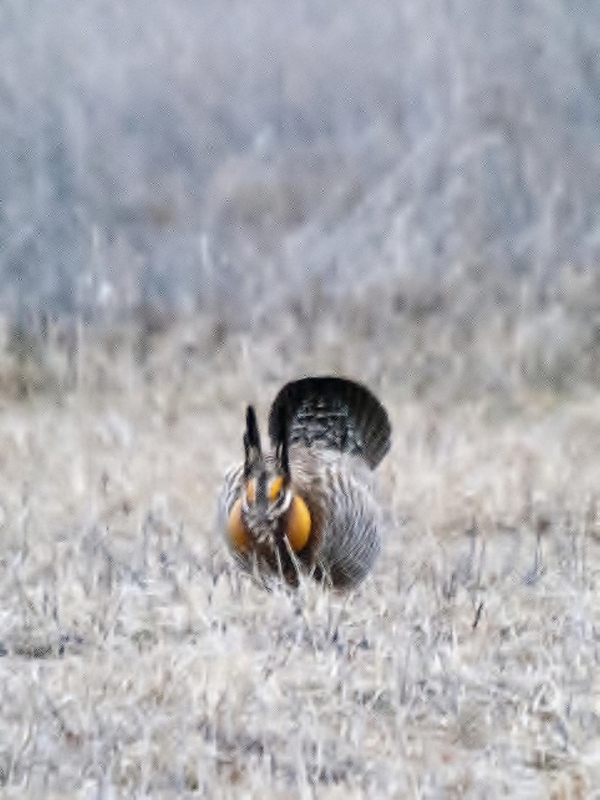 My Dad told me he had seen the Prairie Chicken leks in Southern Saskatchewan when he was a young fellow (like back in the the 1930’s). 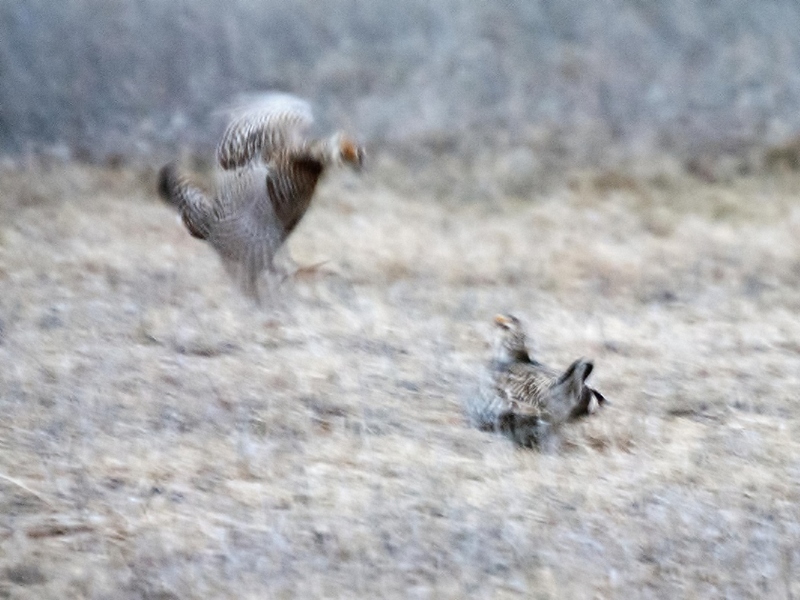 Love the first blurry photo (but I might have a thing for blurry photos) They look like ninja chickens! Also love the orange air sac! Must make spotting them a bit easier once your cones kick in!